Healing Justice began out of necessity in the late Fall of 2018. A group of young women of color and queer folks (QWOC) who held a shared sense of responsibility to create a program that would address the oppression and trauma they were experiencing in their bodies, minds and spirits from the police, government and other white supremacist institutions. They needed a wellness space that understood that the artificial divisions between our activist and spiritual spaces perpetuated colonialism. For more background information, read here. Many of us hunger for a community to support the integration of self care, inner work, collective care, real commitment to challenging injustice, and powerful action. We need a place to gather together to practice embodiment through movement and meditation. We are searching for dialogue that builds trust, leads us to gain insight together, and to strengthen the capacity for resilience in ourselves. Healing Justice is honoring and nurturing our collective capacities to heal ourselves- while supporting QWOC activists in our community through resource sharing and education. Together we are practicing how to bridge our spiritual community and activist community in FCCAN- we are creating Healing Justice, an intergenerational ritual to nourish the body through movement based spiritual practices, cultivate a renewed sense of awe, joy, healing and interconnection for a community of Dreamers, organizers, creatives, community members, and their chosen families. Healing justice has blossomed out of the truth that living systems and structures are learning and changing. 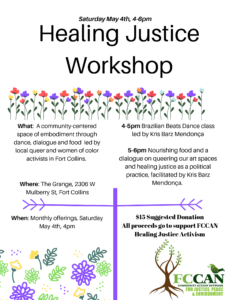 In this moment of history, healing justice is a call to engage and learn from small experiments that center radical dharma, gender justice, nourish critical connections with food justice, decolonize our wellness spaces and build grassroots movements in Fort Collins that support the healing of QWOC.